The VCL framework includes style information such as fonts, TPanels, and backgrounds in each component. For example a TLabel would include the font size, name, and color. The FireMonkey framework uses a Stylebook technique where all component style information for a form is contained in a stylebook for that form rather than in each component. 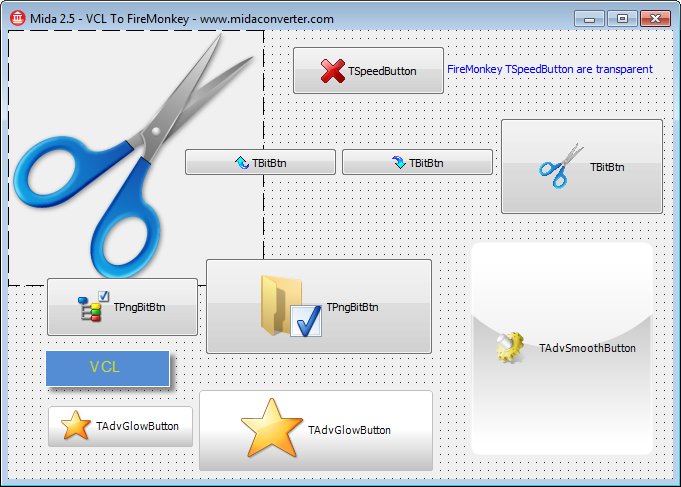 Mida 3 seamlessly and automatically moves the VCL style information into the new FireMonkey stylebook on each form saving you from having to manually cut and paste this information from each component. A real time saver! 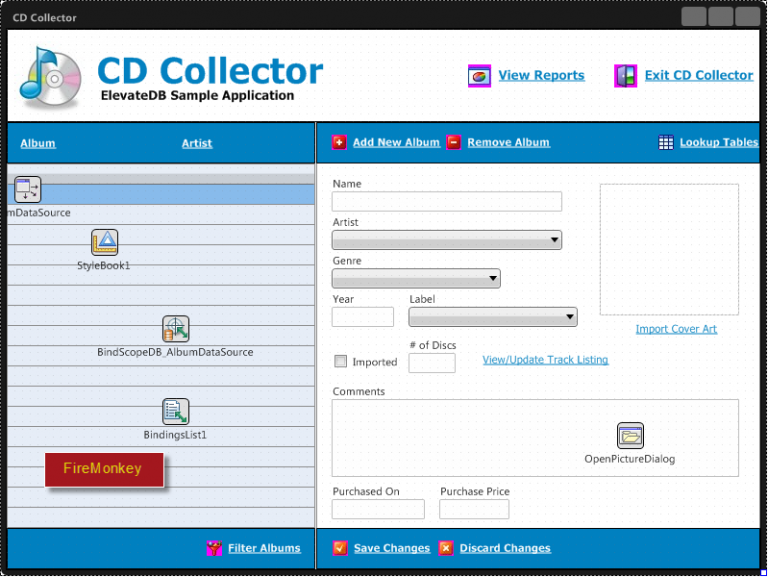 Below is an example of the Elevate Software CD Collector demo conversion from VCL to FireMonkey. FireMonkey does not support the VCL data-ware components such as TDBEdit. 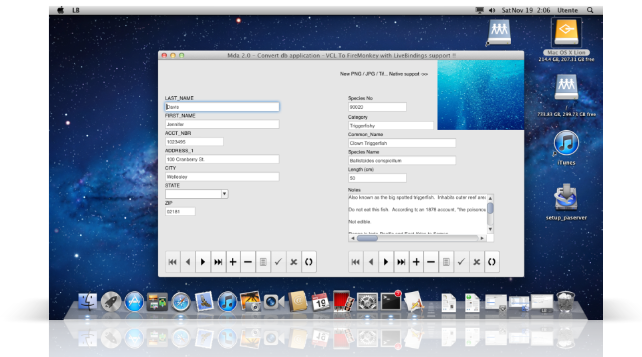 Instead, it uses standard components linked with the new “Live-Bindings” technology. 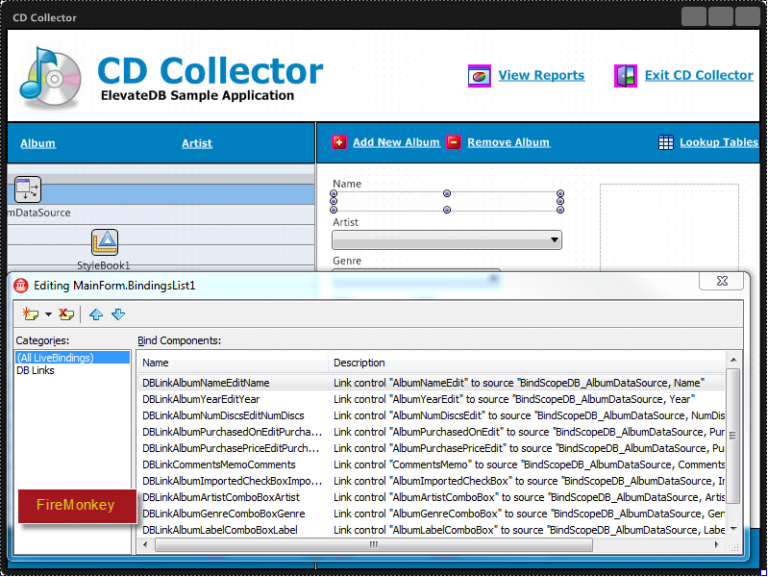 This allows you to easily link most data type components with a database. 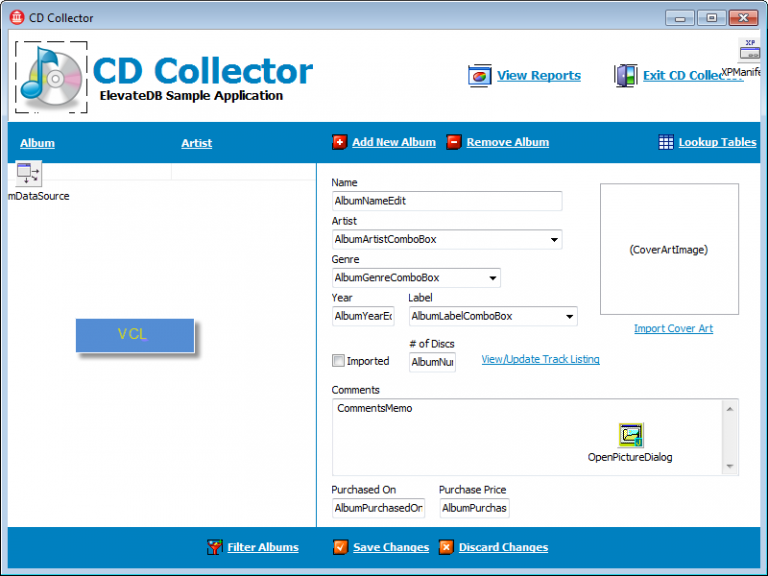 However, most VCL database applications use data-aware components which could be in the hundreds or even thousands so this can require a huge conversion effort when done manually by the developer. Mida is the solution as is fully supports LiveBindings creating all required links automatically. A visual problem with the FireMonkey framework is that it does not support button images like the VCL TBitBtn component. 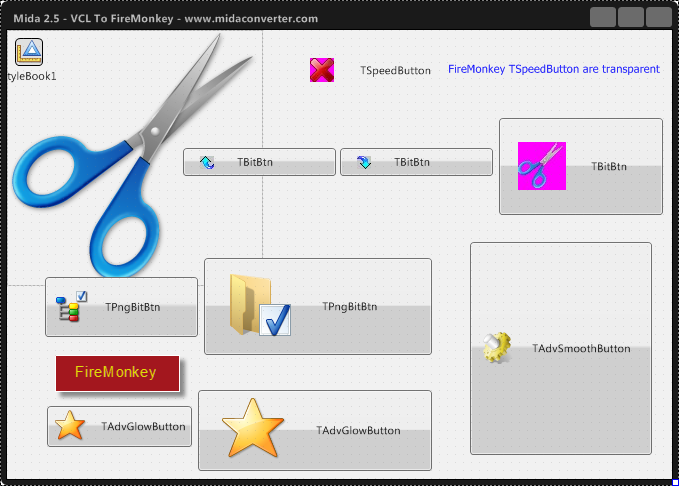 Mida includes a “Mida Pack” set of visual components (TImageButton, TImageSpeedButton) that helps to make the VCL to FireMonkey application conversion seamless producing exactly the same look and feel. These work on Win32 / Win 64 / Mac OSX applications. 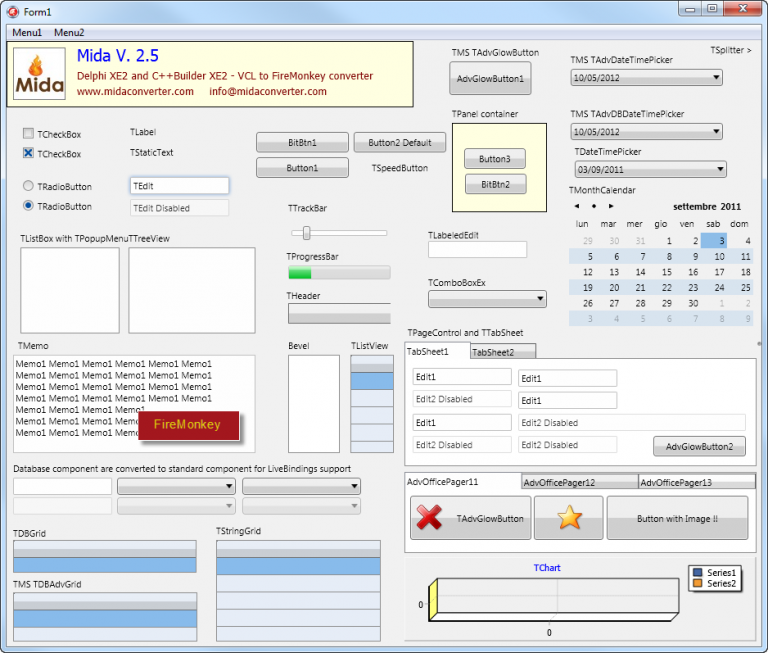 The use of the Mida visual components is optional and can be turned off in the Mida conversion program option page. 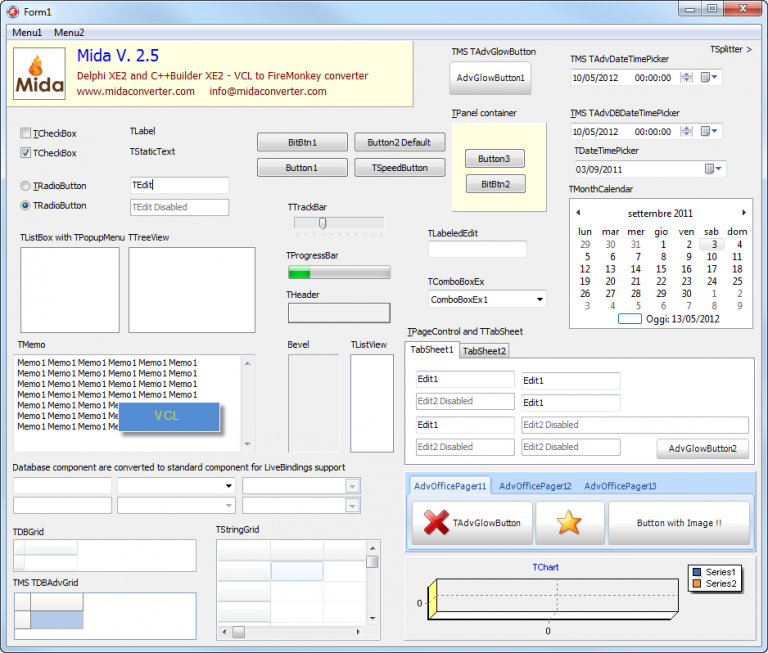 Fully supported are the main Delphi components as well as third party components such as TBitBtn, TSpeedButton, TPngBitBtn, TMS TAdvGlowButton, and TMS TAdvSmoothButton. 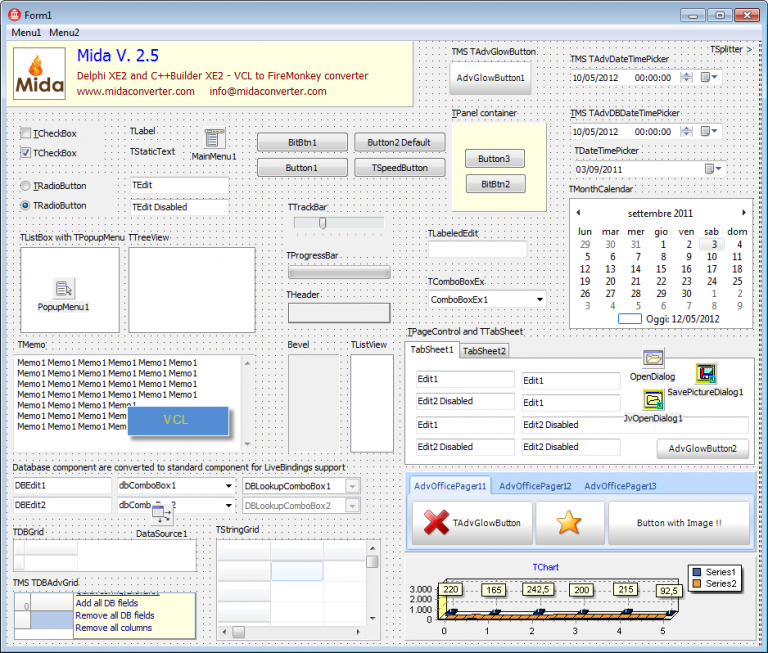 The Mida conversion treats the many Embarcadero Delphi and C++ Builder and third-party components in different ways. 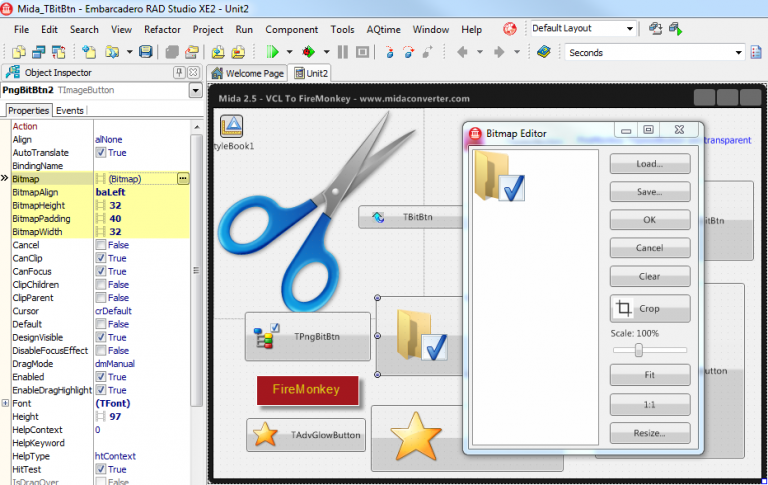 * Some classes are completely replaced, TPageControl is replaced with the TTabControl and Mida reconstructs the component contents for you resulting in exactly the same functionality. * Sometimes the class remains the same, but change the property. The TLabel “Caption” property contents is moved to the new FireMonkey “Text” property. Mida takes care of these problems for you. Projects converted with Mida from VCL to FireMonkey are compatible with Windows 32/64 and Mac OSX / iOS , Android Operating Systems.